One of the first goals of the ABIRISK consortium was to provide clear definitions around terms and concepts related to immunogenicity, its prediction and associated clinical events. 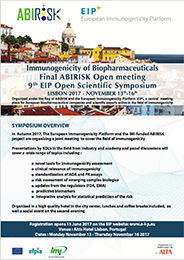 The document "Proposed terms and definitions for reporting immunogenicity results" has been recently finalized by ABIRISK consortium members and it have been just published on Clinical & Experimental Immunology. Congratulations to Laura Magill who has been chosen as the winner of the ‘Young Investigator Award 2017’ by the British Society for Rheumatology. Laura, a PhD student at UCL, is involved in the immunophenotyping of Rheumatoid Arthritis patients, which forms part of ABIRISK. She’ll be giving a talk on this data at the British Society of Rheumatology meeting in April. Link J, Ramanujam R, Auer M et al. Bachelet D, Hässler C, Mbogning J et al. Vultaggio A, Petroni G, Pratesi S et al. The research leading to these results has received support from the Innovative Medicines Initiative Joint Undertaking under grant agreement n° 115303, resources of which are composed of financial contribution from the European Union's Seventh Framework Programme (FP7/2007-2013) and EFPIA companies' in kind contribution.